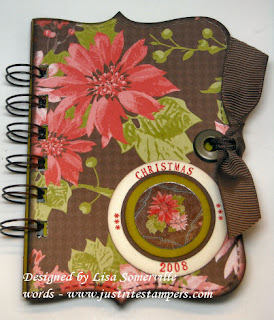 Here's a book I came up with for Christmas using the new Top Note Die, Holiday Treasures DSP and my Bind-it-All. The small word stamps are from the JustRite Small Letter Set. The new exclusive Top Note Die Cut from Stampin' Up! is great for making your own albums. Inspired by the BIA Chipboard Albums, I was able to cut my own using the new Top Note Die - it's quick and easy. To be sure you get the same placement each time - so that your inside pages will line up with your cover - mark a line on your die - then use this as your guide when cutting with your Big Shot. This is another entry I created for the JustRite Stampin' Champion Contest. I have a project featured on the JustRite Blog for this weeks contest entries, don't forget voting is open through Monday. If you have JustRite Stampers be sure to check out the contest details here to see how you can enter, there's some great prizes to be won! To keep my album closed, I added my Jumbo Eyelets with my Crop-a-dile and tied on some 5/8" chocolate grosgrain. Here's another way you could cut your Top Note Die to make an album. Gorgeous Lisa! Love the colors you chose. Between you and Angie I have no choice but to buy this die! Gorgeous book! Oh! You beat me to it...I had thought about doing some type of mini album with this die, too! Great job...love it! Lisa - this is stunning! I knew that die had album potential!!! Oh this is beautiful - I was looking at something like it at Archiver's last night. 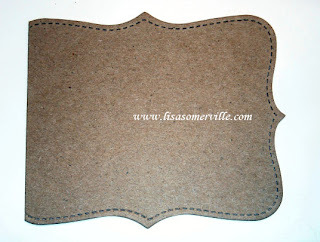 Question - do you just use a tape runner to adhere the DP to the chipboard, or some kind of wet glue?? Just beautiful, Lisa! Another great inspirational project from your creative mind!! I LOVE IT! I feel a case coming on and I need to use the BIA I bought! LOL! !